You’re tired of all the cooking – Making sure the family is fed. 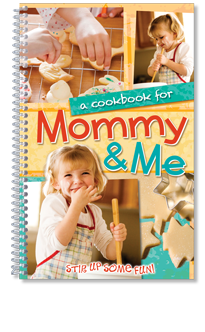 It’s lonely, tiresome work, you know, But then a little voice said... “Mommy, I want to help!” This cookbook features recipes that are perfect for children who are discovering cooking for the first time. With directions for Mommy and directions for her Little Helper, there’s no better way to bring forth creativity and foster new skills. Who knows: you may have the next Julia Child running around your house!